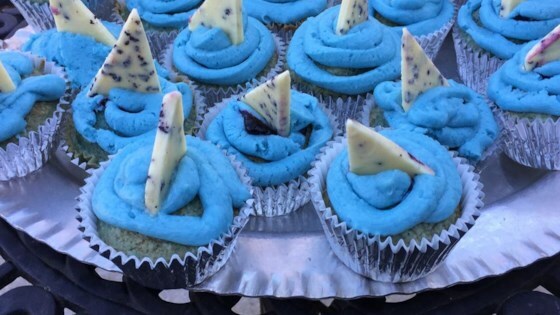 "Berry flavored cupcakes, dyed blue in homage to shark week." Preheat oven to 350 degrees F (175 degrees C). Line two 12-cup muffin tins with paper liners. Beat 1 cup butter and 2 cups white sugar together in a bowl using an electric mixer until creamy and smooth. Beat in eggs, one at a time, until just incorporated. Stir in raspberry extract. Gradually stir flour, alternating with milk, into creamed butter mixture until just combined; stir in 6 drops food coloring. Pour batter into prepared muffin cups, filling them 3/4 full. Place blueberries, 1/4 cup white sugar, and cornstarch in a saucepan; bring to a boil. Cook, stirring constantly, until thickened, 3 to 5 minutes. Remove from heat and allow to cool to room temperature. Cut a small hole in the top center of each cupcake. Pipe the blueberry filling mixture into the holes. Place 1/2 cup butter in a bowl; beat confectioners' sugar, 1/2 cup at a time, into butter using an electric mixer until just combined. Beat in strawberry extract, vanilla extract, and cream. Gently stir about 4 drops blue food coloring into frosting only until a blue-white effect is created. Pipe the frosting on top of each cupcake. Cut the candies to look like a shark's fin. Place one fin on top of each cupcake. Learn how to make these fun Reindeer cupcakes for Christmas! it came out very yummy! Instead of berry I used all raspberry instead of strawberry abstract and blueberries. The frosting was a pain to make and made a mess.